Situated between Piazza Strozzi and via Tornabuoni in the heart of Florence, the Palazzo Strozzi is one of the finest examples of Renaissance domestic architecture. It was commissioned by the Florentine merchant Filippo Strozzi and the foundations were laid in 1489 according to a design by Benedetto da Maiano. A year later the project was given to Simone del Pollaiolo, known as Cronaca, who worked on it until 1504 but the Palazzo was only finally finished in 1538. The Palazzo remained the property of the Strozzi family until 1937, and since 1999 it has been managed by the City of Florence. The Via de' Tornabuoni has served as the setting for pageants and processions to the cathedral and baptistery since mediaeval times. In the 15th and 16th centuries, influential Patrician families such as the Strozzis, Tornabuonis and Vivianis built their palaces here. Since the 18th century, these buildings have often been used as an imposing backdrop in graphical portrayals of the Via de' Tornabuoni as a place for urban promenading, whereby the visualisations by Giuseppe Zocchi, the eminent Florentine copper engraver (died in 1767) were used as templates. Our first plate is dominated by the massive stonework of the Palazzo Strozzi, which was the first palazzo of the Quattrocento to have three complete front sides. To balance this, the street stretches across the entire right side of the picture to a square. Emilio Burci’s view of the monumental west front of the Palazzo Strozzi towards the north points to the Palazzo Viviani and Palazzo Corsi, both bathed in sunlight, in a similarly sweeping manner. Here, as on our third plate as well, the old front of the Palazzo Corsi (formerly Tornabuoni) is visible with the Cigolis Loggia, which disappeared when the road was widened in the 1860s. A purely architectural interest is hidden behind the printed elevations of individual palaces. Alongside the Renaissance palaces, such as the Palazzo Pandolfini accredited to Raphael, contemporary works appear, such as the copper engraving showing the front of the Palazzo Borghese, which was published shortly after completion of the palazzo in 1821. The Strozzi family was a Florentine family in the banking sector with branches all over Europe. The family grew rich through commerce and took an active part in the government of Florence after the 13th century. Until its exile from Florence in 1434, the Strozzi family was by far the richest in the city, and was rivaled only by the Medici family, who ultimately took control of the government and ruined the Strozzi both financially and politically. This political and financial competition was the origin of the Strozzi-Medici rivalry. "Strozzi's design culminates the Florentine palazzo 'pattern,' which favors a flat facade of three stories — each level marked by a prominent full-width stringcourse (horizontal banding) — topped by an outsize cornice.... Stone of almost theatrical rustication commands the facade, with semicircular arches crowning all the major openings. Note that the radating voussoirs (wedge-shaped stones) of the arches increase in length as they rise to the keystone. Divided two-arched windows with varying ornamental panels are typical of the upper floors, while squarish windows mark the lower. A haughty main entrance leads to a central courtyard." The Palazzo Strozzi’s courtyard is the perfect piazza-gallery, with entrances from Via Tornabuoni, Via Strozzi and Piazza Strozzi. Palla Strozzi (1372-1462) played an important part in the public life of Florence, and founded the first public library in Florence in the monastery of Santa Trinita. Filippo Strozzi il Vecchio (1428-1491), son of Matteo Strozzi and of Alessandra Macinghi is credited with initiating construction of the Strozzi palace in Florence. At an early date the family divided into several branches. Palla Strozzi, c.1373–1462, a politician and ardent humanist, furthered Greek studies in Florence and Padua. Filippo Strozzi, 1428–91, son of Matteo Strozzi, gained wealth and influence in Naples, and returned to Florence in 1466. Back in Florence, he built the famous Strozzi Palace. In the fifteenth century, the Strozzi strongly opposed the Medici rule of Florence and were exiled when Cosimo de' Medici seized power in 1434. while the Medici ruled Florence, the Strozzi family was ruling Siena. Florence attacked Siena at that time, which caused great animosity between the two families. Soon afterwards, the Strozzi married into the Medici family, essentially giving the Medici superiority. Filippo II (1488-1538) is probably the most well known member of the family. Although married to Clarice de' Medici, a daughter of Piero di Lorenzo de' Medici and member herself of the Medici family, he was vehemently opposed to the hegemony the Medicis had acquired as the unofficial rulers of the Florentine republic and was among the leaders of the uprising of 1527. After the republic was overthrown in 1530 Alessandro de' Medici attempted to win Filippo Strozzi's support, but Strozzi declined and instead retired to Venice. After the murder of Alessandro in 1537 he assumed leadership of a group of republican exiles with the object of re-entering the city but having been captured and subsequently tortured he committed suicide. His son Giovanni Battista, known as Filippo Strozzi, 1489–1538, married a granddaughter of Lorenzo de’ Medici, Clarice, and accumulated vast riches as the pope's finance administrator. He was forced into exile by Alessando de' Medici, and plotted with son Piero to overthow Cosimo de' Medici in 1537. Defeated and jailed, he died by suicide. His son of Filippo, Piero Strozzi, d. 1558, a violent enemy of the Medici, fought for the French in the Italian Wars and was made a marshal of France. He took part in the French siege of Calais (1557). His other son Leone Leone Strozzi, 1515–54, first entered the Order of Malta and later became an admiral in the French service. He distinguished himself in wars against Spain and England. Filippo Strozzi, 1541–82, was also in the French service. He was captured and killed by the Spanish in a naval battle off the Azores. Wedding Chest or cassone showing the Coat of Arms of the Strozzi Family. Anonymous Florentine craftsman, last quarter of the fifteenth century. Wood covered with vellum painted in tempera, gilded leather, 45 x 160 x 47 cm. Grassina (Florence), Carlotta Bruschi Collection. Collezione Carlotta Bruschi, Grassina © Fotografía: Giusti Paolo e Claudio. Cassoni were usually made and given in pairs as part of a marriage contract, and were commissioned by the groom. Villa Vistarenni was a former a summer residence of the Florentine Strozzi family, between the towns of Radda and Gaiole in Chianti. Open daily (including Monday) from 9am to 8pm. Free Thursday nights (9-11pm). Tickets cost 10 euros for adults, various discounts available (including upon presentation of a Trenitalia card or ticket). Since July 2006, the Fondazione Palazzo Strozzi has successfully devised and implemented a rich and innovative programme of exhibitions, events and activities in the various areas of the Palazzo such as the Piano Nobile, the Strozzina and the Courtyard. The Palazzo Strozzi now hosts three major exhibitions annually, and is open year-round with a café/bar, and a permanent exhibition on the history of the Palazzo Strozzi. In November 2007 the spaces under the courtyard were re-opened as the Centre for Contemporary Culture Strozzina (CCCS) and will host a wide variety of activities including exhibitions, events, lectures and programmes designed to appeal to a broad spectrum of users of all ages, nationalities and backgrounds. Since the Second World War the Palazzo has been Florence’s largest temporary exhibition space. Among the major exhibitions held at Palazzo Strozzi have been the Peggy Guggenheim Collection (1949), 17th century Florence (1986), Gustav Klimt (1992), La Natura Morta Italiana (2003), Botticelli e Filippino Lippi (Italy’s most visited exhibition in 2004), Leon Battista Alberti (2006) and Cézanne in Florence (Italy’s most visited exhibition in 2007). Under the directorship of Franziska Nori, the CCCS realizes cultural projects about socially relevant issues that stand at the basis of our contemporary reality. The audience become a protagonist through a straight and ongoing relationship with the centre. The exhibition space is located in the recently restored spaces under the magnificent courtyard of Palazzo Strozzi – known as ‘La Strozzina’ – which previously housed the cellars of this Renaissance monument, and which hosted Florence’s most important international exhibitions in the years after the Second World War until the flood of 1966. Since November 2007, this place has reborn as Center for Contemporary Culture Strozzina, which comprises eleven rooms of different sizes, approx. 850 square metres. The challenge posed by the Renaissance architecture of Palazzo Strozzi for contemporary art is taken as a stimulus to stage each new event and project constantly pursuing new possibilities of artistic communication and presentation. The Fondazione Palazzo Strozzi has set up this small permanent exhibition to give the public insight into the history of the Palazzo where the Foundation is housed. Eight panels give an account of the fortunes of the Strozzi from the fourteenth century to the present day while a genealogical tree helps the visitor understand the complexity of the family’s various noble connections. A Renaissance model of the building is also on display. The Palazzo takes centre stage. Begun by Filippo Strozzi in 1489, this extraordinary example of domestic Renaissance architecture is a confident interpretation of the stylistic innovations introduced into Florence in the mid-fifteenth century. Rich families at the time broke with tradition and changed the face of Florence by creating these spacious and imposing palazzi, prestigious buildings immediately recognisable in their urban context. Brief but informative texts outline exiles and rebels, fortunes won and lost, and the collection and dispersal of art works, now to be found in the world’s leading museums. We glimpse the lives of family members, both men and women: merchants, patrons and men of war, courtiers and humanists, who have all made their mark on history. The exhibition touches on events leading up to the sad decline of the early nineteenth century, and includes anecdotal information from the parents of the present heirs. This leads onto the dramatic sale of the building to the Istituto Nazionale delle Assicurazioni, the ambitious restoration programme, the great exhibitions held since the 1940s, the impact of the flood and the role of the Palazzo Strozzi in Florence today. The story is illustrated with images and photographs of the Palazzo and the Strozzi family, including those of paintings and sculpture once in the Strozzi collections: works by Gentile da Fabriano, Beato Angelico, Filippino Lippi, Bronzino, Michelangelo and Bernini. There are portraits of members of the family by Benedetto da Maiano or Titian. Rare or unpublished images document the restoration carried out in the 1930s, a series of important exhibitions, the drama of the flood and the revival of recent years. A Florentine family in the fifteenth century, by E.D.R. Bianciardi | Those who are curious to know something of domestic life in Italy in the fifteenth century, especially the life of the female members of the household, will find much of interest in the Letters of Alessandra Macinghi, the widow of Matteo Strozzi, to her exiled sons. The Kunsthistorisches Institut in Florenz is one of the oldest research institutions dedicated to the History of Art and Architecture in Italy. Zoege von Manteufel was the director of the Kunsthistorisches Institut in Florence and developed the prints collection into one of the most representative collections in the west. The “creation of a large collection of illustrations suitable for comparative studies” was one of the main aims of the Kunsthistorisches Institute in Florence right from its establishment in 1897. This early collection, which came from donations and bequests, contains not only conventional photographic material but also engravings and prints. G.E. Kidder Smith, Looking at Architecture, New York: Harry N. Abrams, Publishers, 1990, p68. Cassone, Italian chest, usually used as a marriage chest, and the most elaborately decorated piece of furniture of the Renaissance. Cassoni traditionally were made in pairs and sometimes bore the respective coats of arms of the bride and groom. They contained the bride’s clothes, linen, and other items of her dowry. In the 15th century, when the greatest importance was attached to suitable marital alliances between Florence’s wealthiest families, the cassone reached great heights of artistic achievement. Florentine artists such as Sandro Botticelli, Paolo Uccello, and Donatello were employed to decorate cassoni with paintings set in an architectural framework. Battle scenes and classical and literary themes were especially popular. On the wedding day, the cassone was carried in procession through the streets to the bride’s new home. The Strozzi Family | Other family members | Filippo Strozzi's older son Piero (1500 - 1558), fought in France against Italy and Spain, and was made a Marshal of France in 1554. He took part in the French siege of Calais (1557), and died of wounds incurred in battle at Thionville, in Lorraine, in 1558. The younger son Leone (1515-1554) was a distinguished admiral in the service of France and fought against the Medici. He died of a wound received while attacking Sarlino in 1554. Filippo di Piero Strozzi (1541-1582) served in the French army, and was captured and killed by the Spaniards at the Battle of Terceira. Senator Carlo Strozzi (1587-1671) formed an important library and collected a valuable miscellany known as the Carte Strozziane, of which the most important part is now in the state archives of Florence. He was the author of a Storietta della città di Firenze dal 1219 al 1292 (unpublished) and a Storia della casa Barberini (Rome, 1640). It is unclear whether Bernardo Strozzi (c.1581-1644), a prominent and prolific Italian Baroque painter born and active mainly in Genoa and Venice, was a part of this immediate family. The composer Barbara Strozzi (1619-1677) was adopted by the poet Giulio Strozzi, presumably her natural father. Family fortune | Until its exile from Florence in 1434, the Strozzi family was by far the richest in the city, and was rivaled only by the Medici family, who ultimately took control of the government and ruined the Strozzi both financially and politically. This political and financial competition was the origin of the Strozzi-Medici rivalry. Later, while the Medici ruled Florence, the Strozzi family was ruling Siena. Florence attacked Siena at that time, which caused great animosity between the two families. Soon afterwards, the Strozzi married into the Medici family, essentially giving the Medici superiority. The Strozzi acquired by marriage the titles of Princes of Forano and Dukes of Bagnolo. The Strozzi palace belonged to the family until 1937 when it was sold to the National Insurance Institution 'Istituto Nazionale delle Assicurazioni (INA).From 1999 it became Italian State's property. Today, the Strozzi descendents are still living in Florence. Villa Vistarenni | Between the towns of Radda and Gaiole in Chianti, two key production centres in the history of Chianti Classico, there extends a large farm of approx 500 acres, called Fattoria di Vistarenni. 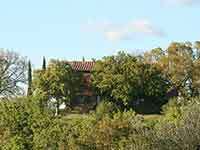 The 16th century Villa Vistarenni dominates it from a hilltop 500 m above sea level. 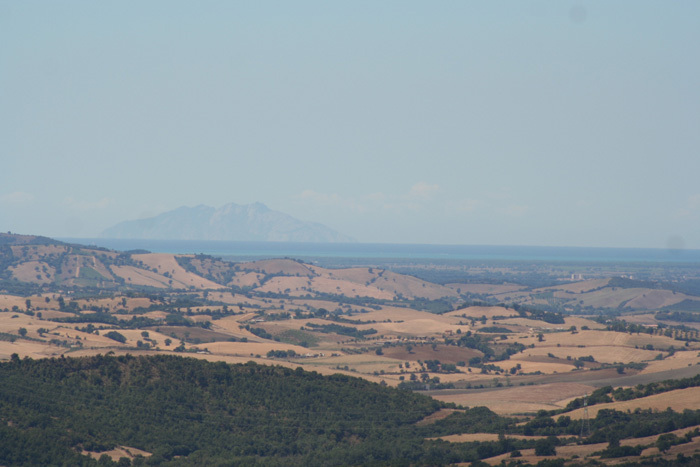 Vistarenni, that stems from “Fisterinne”, Etruscan name that means “good view”, was a small, fortified settlement that still existed in the year 1000 in the site where the villa stands nowadays. Villa Vistarenni was a former a summer residence of the Florentine Strozzi family, and later of the Sonnino family, which gave birth to some senior officers of state in early Italian governments. The mansion now belongs to the Tognana family.